Many of Confoil’s products can be custom printed to increase your branding and help you stand out from the crowd! The printing is able to be single or multi coloured, with a random or registered print depending on the application. While often considered expensive, there are many ways to create a custom product that fits into your budget, start with a single colour logo or design which will allow you to increase your brand awareness among customers while keeping your budget in check. 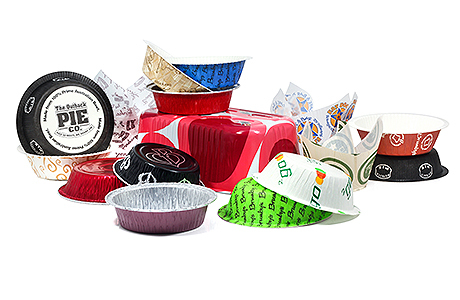 We are not limited to parchment muffin wraps and Dualpak paperboard products; our aluminium foil trays and pop up sheets can also be printed with a company colour, logo or cooking instructions. Using a block colour print on a tray or a pop up foil can help you easily identify the type of meal it contains, vegetarian, gluten free, seafood etc. With industry knowledge and support that only a manufacturer can offer we are able to help you create a custom packaging design, refine your existing containers, or guide you through the packaging options for your product, our Confoil technicians are at hand to provide expert help.